Der Artikel Steve Jones: Fire And Gasoline (Collector's Edition) (Remastered & Reloaded) wurde in den Warenkorb gelegt. His debut solo album, Mercy, was a regarded as a tentative step towards redemption but it was Fire And Gasoline, the follow up album, that really saw his creative juices flow freely. It was a tougher and far more direct display of fire-power, bringing Jones’ guitar prowess once more to the fore. 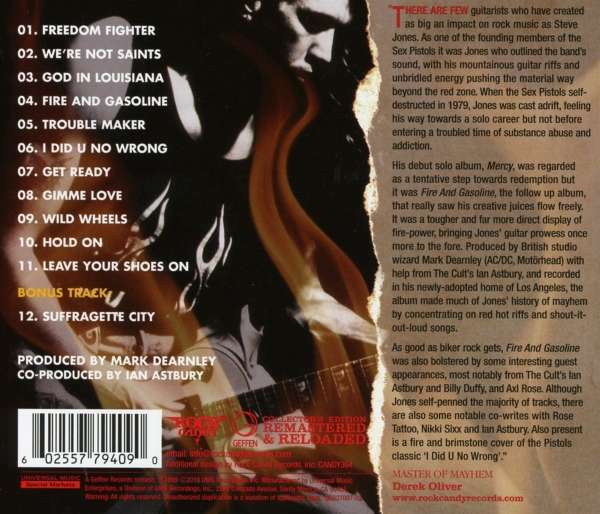 Produced by British studio wizard Mark Dearnley (AC/DC, Motorhead) with help from The Cult’s Ian Astbury, and recorded in his newly adopted home of Los Angeles, the album made much of Jones’ history of mayhem by concentrating on red hot riffs and shout-it-out-loud songs. 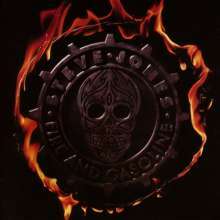 As good as biker rock gets, Fire And Gasoline was also bolstered by some interesting guest appearances, most notably from the CULT’s Ian Astbury and Billy Duffy, and Axl Rose. Although Jones self-penned the majority of tracks, there are also some notable co-writes with Rose Tattoo, Nikki Sixx and Ian Astbury. Also present is a fire and brimstone cover of the Pistols classic “I Did U No Wrong.